Boeing’s P-8 military anti-submarine version of the 737 is built very differently and yet integrated into the regular 737 supply chain. That makes it one of the Pentagon’s most efficient programs. 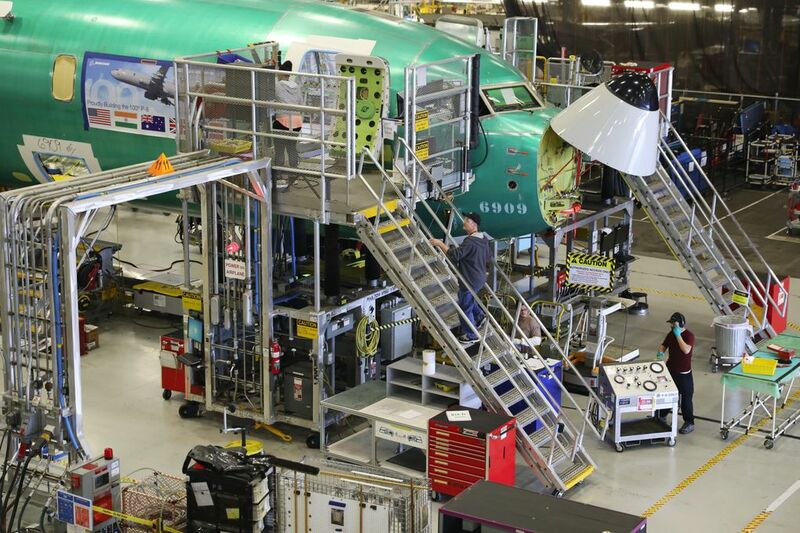 At Boeing’s Renton assembly plant, there’s a fourth, slow-moving assembly line in a separate building from the three main jet-production lines. The main lines are churning out at record rates two versions of the familiar 737 commercial airliners, including the latest 737 MAX model. The fourth line produces a much different beast. This is where the P-8 submarine hunter is built for the U.S. Navy and various foreign countries. A military version of the 737, the P-8 is equipped with radar, optical and sonar sensors, and it is armed with anti-ship missiles and torpedoes. It’s designed to patrol the oceans to detect and attack threats including hostile submarines capable of firing off nuclear missiles. 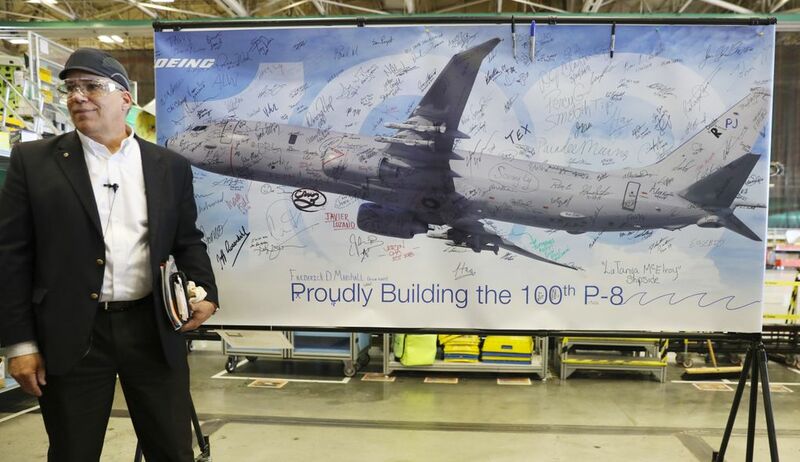 On a tour of the Renton production facility Wednesday, the P-8’s deputy program manager at Boeing Commercial Airplanes, Carl Lang, showed off the 100th P-8 on the assembly line and described just how differently it’s built. While each commercial 737 takes about two weeks to assemble, each P-8 takes more like two months. Yet Boeing has integrated all these differences into its 737 supply chain to make this the most efficient military derivative the jet-maker has ever manufactured. All the structural changes to the standard airframe that are needed to turn it into a militarized jet are incorporated as it is built. The P-8’s exterior bristles with blades and fins, antennae used to detect radio or acoustic signals. A door opens to let an electro-optical/infra-red (EO/IR) camera protrude from underneath the fuselage. Inside, operators sit at five computer work stations with touch screens, monitoring the data from these sensors and linking with other aircraft and military assets. To listen for submarines, they drop noise-detecting sonar buoys into the ocean from tubular holes in the jet’s underbelly. Another tube is part of a protection system that dispenses metallic chaff and flares to confuse incoming missiles. Harpoon missiles attached to the wings can strike surface ships. Mark 54 torpedoes are hidden in a large bomb bay. All the military communications, sensor and weapons systems are installed inside a defense-division facility beside Boeing Field in Seattle, located at the old Thompson building — where the initial 737 airliners were built in the 1960s. But first, Boeing Commercial must deliver to the defense facility a 737 that’s beefed up to hold all that military hardware. This is why the P-8 production line in Renton is separate and customized. So that the P-8 will be able to withstand much more stressful maneuvers than a commercial 737 will ever make, its aluminum skin is 50 percent thicker than a regular 737’s and the fuselage and wings have more stiffening stringers and frames, meaning many more rivets. Because it will sometimes on missions fly low over the ocean, every surface from the nose cone to the horizontal tail must be equipped for de-icing. The P-8 fuselage, assembled in Wichita, Kansas, by Spirit AeroSystems, arrives by train in Renton with the bomb bay already cut out of the belly. Although the fuselage doesn’t have regular passenger windows, it comes with a large picture window cut out on each side to accommodate a spotter looking for surface vessels. The large compartment that will house that EO/IR camera is reinforced to withstand the pressure when the camera door opens. Steel fittings on the wings are added to hold the missile pylons. The cargo hold is configured for seven extra fuel tanks. A receptacle is built into the forehead of the jet so that it can receive fuel in flight from an Air Force tanker. Inside the 100th airplane Wednesday, wiring bundles covered the interior walls, needed because the plane’s systems use twice as much electrical power as a regular 737. Electrical cables as thick as rope dangled from the pylons where the engines will be hung, to take the power from the extra electrical generator that’s added to a P-8 engine. All of this customized hardware is delivered through the regular 737 supply chain. Boeing asks its suppliers — delivering 47 airplanes per month, going up soon to 52 per month — to insert the special P-8 hardware for just one or two planes a month. It’s worked well. 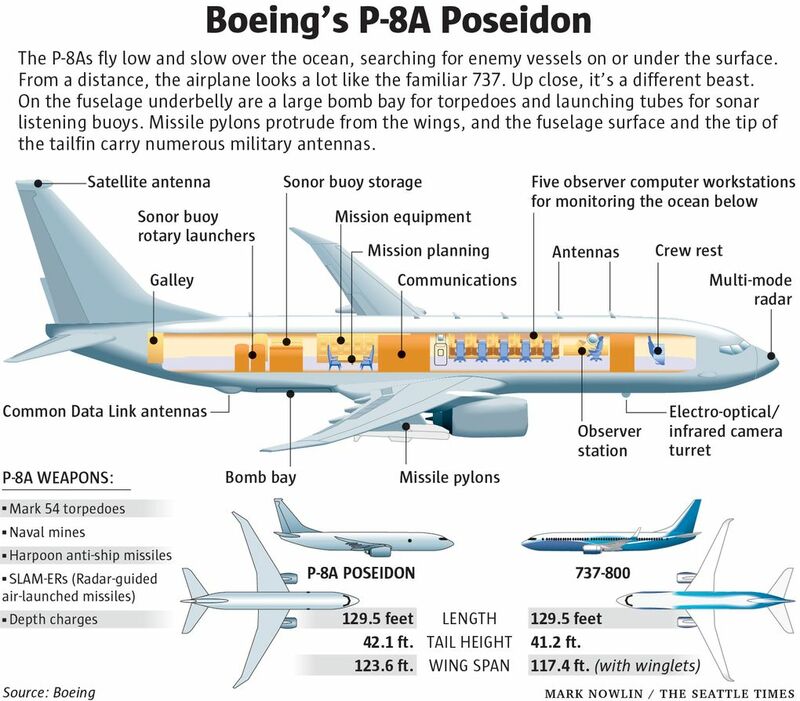 The P-8 is Boeing’s exemplary, on-budget jet program for the Pentagon. The U.S.’s total development and procurement cost for the P-8 has gone down 3 percent from earlier estimates. With production flowing smoothly, Boeing is incrementally adding more capabilities to the aircraft. The Defense Department has funded a $3.5 billion follow-on contract that will include communications, radar and weapons upgrades to enhance the P-8’s search, detection, and targeting capabilities. The U.S. is expected to take 117 of the jets, and those improvements will be retrofitted on the 68 planes already delivered to the Navy. With the planned upgrades, the latest Pentagon acquisition report pegs the total development and procurement cost at $34 billion, or about $290 million per airplane. However, with development costs now largely covered, the latest Pentagon budget cites the “flyaway” cost of an additional order at just over $170 million per plane. The P-8 has attracted foreign orders, a dozen each for India and Australia, nine for the United Kingdom and five for Norway. New Zealand is expected to place an order for four P-8s imminently. Although no P-8 has yet fired its weapons in combat, the Navy has deployed the aircraft on intelligence, surveillance and reconnaissance missions in the western Pacific, the Mediterranean and North Atlantic. The Pentagon considers the P-8 an essential asset for any potential conflict with Russia or China. India, Australia and New Zealand all have vast ocean borders and all perceive a potential threat from the expansion of China’s navy. On the commercial side, Boeing is phasing out the current model of the 737 in favor of the new MAX. By the middle of next year, only the MAX will be produced for airlines and the P-8 will remain the sole version of the 737 based on the older model. The U.S. Navy and foreign buyers combine for a total of 146 P-8 orders, with 50 of those still to be filled. At Boeing’s current rate of building 18 aircraft per year, that’s less than three years of production. The Pentagon budget for the P-8 falls dramatically in 2021 and goes to zero in 2022. But Lang said Boeing hopes for more international orders to keep P-8 production going.